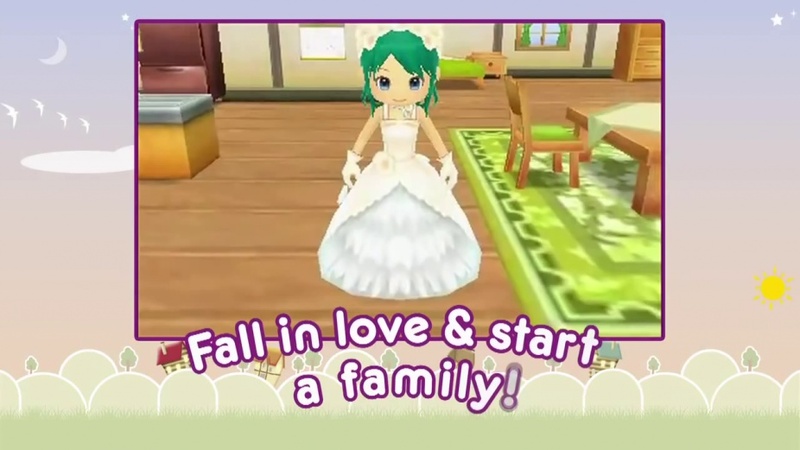 The opening already make it quite clear that Harvest Moon: A New Beginning will not surprise us - at least not storywise. We start our new life as a boy or girl in a small village called Echo to raise and improve the farm we just inherited. So far, so unspectacular. However, Harvest Moon: A New Beginning kicks off rather slowly - so slowly you might not even finish the first in-game month. The lack of an interesting storyline is only partly to blame. The game's slow beginning is due to the tutorial extending over 31 days in total. During the first few, you learn the basics of farm life. Regardless of whether you are a series veteran or newcomer, you can't skip some of the tedious explanatory scenes. The core concept, however, has remained the same since the early instalments. Our life as a farmer mainly consists of raising crops (fruit, vegetables or flowers) taking care of animals (cows or sheep) and selling our goods to earn our living. While it takes some time until that turns into a profitable business, we can also explore the wilderness around the village to collect walnuts, fish or honeycombs for some extra cash. Compared to the village with its mammoth population of - dun dun dun- three people, the little grove with its animals and insects seems rather lively. Unlike in the previous handheld games, Harvest Moon: The Tale of Two Towns, the little creepy-crawlies don't scurry away when we're too slow to catch them. Instead they'll simply hop around until we put them in their cage. So it's not hard to imagine that earning money can be an easy business out here. But what are we going to do with all that money in a village with only three old people to interact with? The answer is a small surprise: We invest in our personal taste and the enlargement of our farm area. From the moment we get to know this newest feature the game has to offer, Harvest Moon: A New Beginning finally picks up speed. The 3DS instalment is all about customisation. So, one of the first things to do in the game is customising your character. The options aren't extensive, but it's an improvement over their previous non-existence. Among other characteristics, we get to choose a neat haircut and our working clothes. But the real motivation to play the game lies somewhere else: blueprints. For the first time we customise the whole village. By building new houses we enlarge the village and consequently invite new inhabitants with new professions. My first new building, for example, is the house of a newspaper carrier called Tina, which I place at the upper left corner of the screen. For now, it's highly unlikely that I will frequent Tina's house so I won't need it nearby. However, if you are planning to conquer her heart, maybe you want to put her house next to entrance of your farm. It's up to you. We are also not limited to creating new buildings within our borders, but can relocate every existing building and even fences the way we like. It's a lovely way to motivate us to collect money and gives the tedious working rhythm some sort of reason, as the whole being-the-architect-of-the-town-business is quite expensive. After finishing the daily routine of watering the plants or harvesting crops, we take a detour to the studio to have a look at new ways to make this village our own. However, the developers have made another clever decision. The different options of building new structures are connected to our interaction with the villagers. By giving them gifts and earning their friendship, they will often reward us with new blueprints. For example, as we get to know Iroha, a girl who trains to become a blacksmith, we will be able to upgrade our tools - a very nice way to keep us interested in the life of our fellow men rather than just living a lonely existence on an old farm. The graphics are decent. The grass lacks some details, but the animals and people are kept in the same lovely design that we're used to, and especially the wilderness is a place you will like to spend your time in. The soundtrack is nothing to write home about, but at least it's pleasant and won't annoy you. Harvest Moon: A New Beginning is - in many aspects - familiar. We encounter many well-known characters with a somewhat new design like the helpful harvest sprites, we endeavour to win the heart of local boys (or girls) or attend festivals, not unlike those in the previous games. Yet, there's a new touch to everything. By winning a festival for example, we increase the awareness for our brand and consequently get more money when selling award-winning goods. The tedious - extremely boring - tutorial at least gives newcomers a complete outline of the basic gameplay, even though it would have been nice to allow veterans to skip it completely. However, when we finally get to the part when we experience the new gameplay elements and the new freedom they bring to the Harvest Moon series, it really is a lot of fun to see how the village grows with new residents moving in. Harvest Moon: A New Beginning is actually a new beginning for the franchise in some ways as it finally adds a new dimension to an overly familiar gameplay. new options for character customisation, lovely design, blueprints to relocate and build houses, fences etc.